No country can run on lies no matter how foolish the populace may be, the days of reckoning must come and the populace will start asking questions, such days has come along with a revolution to set the children of light free from this zoological contraption called Nigeria. general and described his death as an assassination. 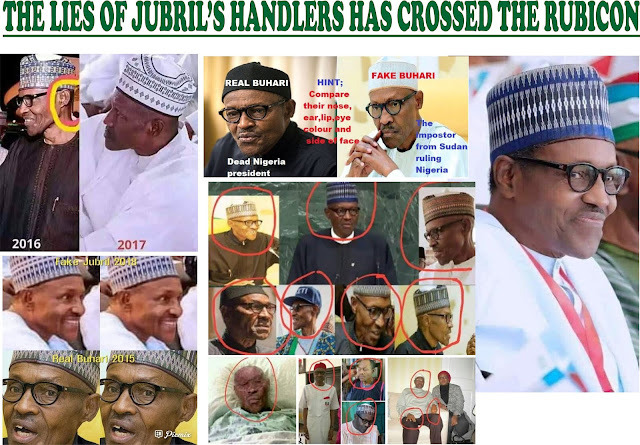 He is gone but the truth cannot be killed as the cabals have been searching for more lies, ways and manner to cover the truth which even lead to the operation Python dance to kill Onyendu Mazi Nnamdi Kanu and in that process about 28 men died, the issue of Jubril has been quiet for 13 months since the forced unavailability of Onyendu Mazi Nnamdi Kanu. Since his reappearance in Israel he has been hitting hard on the selfish politicians and the zoo (Nigeria) is crumbling because the truth is been propagated. The sudden parade of Aisha by this Sudanese is one of the ways to cover the truth by deceiving the populace into believing that this cloned impostor is Buhari. Each time they try to cover up this fraud of the century they end up giving us reason to ask some valid questions. The Buhari seen with Aisha sees without eyeglasses. The gap between Aisha and her supposedly husband. Osinbajo was more or less like the wife from their standing position and he Jubril was smiling while his wife frowning. Also note that since after the return of Jubril Aminu from the alleged trip to Paris. This is the first public appearance of him and Aisha; now the question is why now? Because even when Prince Charles came with his wife Jubril received him without Aisha. Why did Jubril left Nigeria deceiving the masses that he is going to attend end of first world war summit and on reaching there fail to attend the summit and the next thing is Photoshop of pictures that he was there, I don't know if God blinded the thinking of Femi Adesina when he Photoshop the president with other world leaders when they were looking up while only Jubril was looking elsewhere, it’s a shame that Jubril's handlers choose to deceive the masses instead, it’s now clear that the lies of the cabals have crossed the Rubicon (a point of no return) and instead of packaging Jubril and sending him back to Sudan. They should be destroyed together with him and IPOB will supervise their downfall because IPOB has broken the cordon of lies like my friend and brother Analyzer blinks will always say the "Biafra struggle has crossed the Rubicon." They can continue to lie but at the end Jubril will be destroyed alongside Abba Kyari the Sokoto caliphate and the contraption called Nigeria.